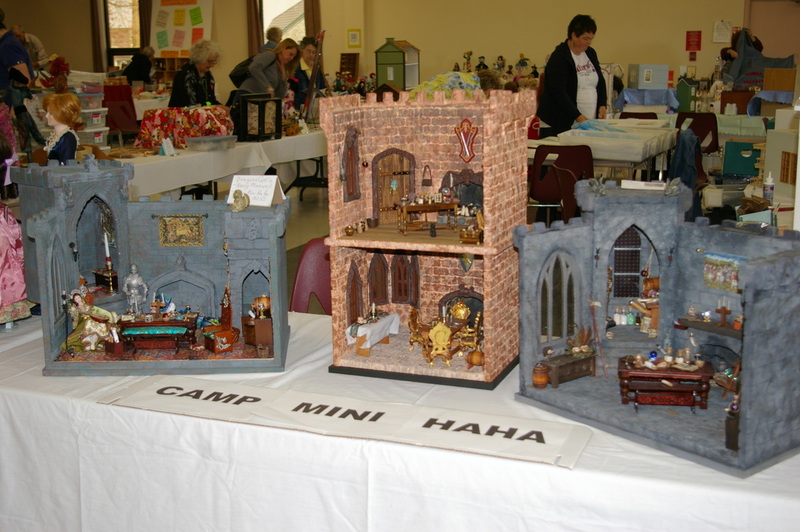 I will be attending the Moncton Doll and Miniature Show in Riverview, NB on March 7, 2016. 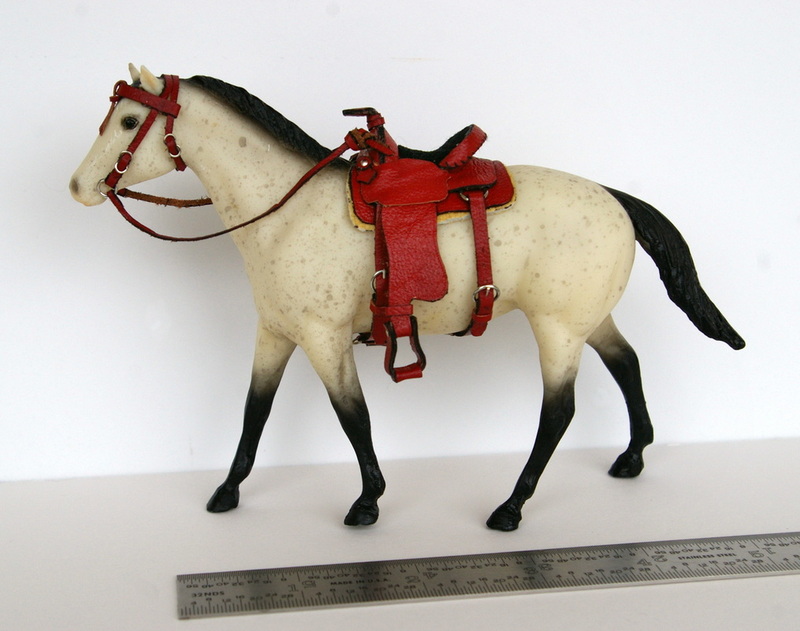 I will have some new products, mostly saddles and other horsey items but there will be some other items for the non-horsey set as well. I'd better get cracking! For those interested, the address is 5 Fatima Drive, Riverview, NB from 10:00 am-5:00 pm. 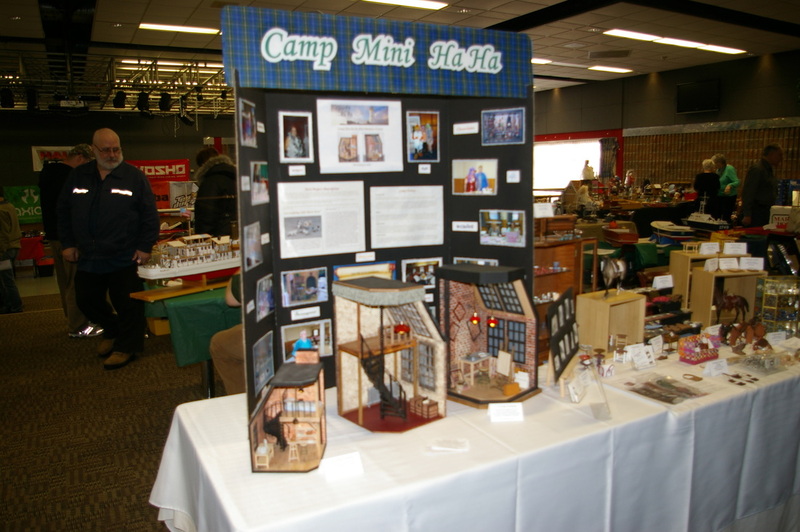 The 18th Annual Shearwater Hobby Show took place and was a success despite the snow we received Sunday morning. Saturday was busy with wonderful displays and fabulous weather. The venue was changed from years past, taking place at the Sea King Club, not far from the Museum. This will likely be the new home of the show since the museum has less space now that it has acquired a new airplane for its exhibit area. 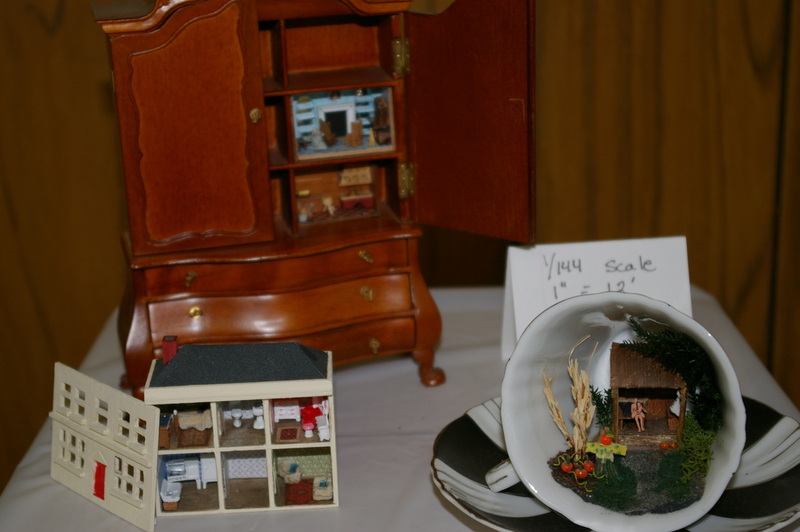 At the last minute, I decided to attend the Moncton Doll and Miniature Show and Sale in Riverview, NB. There was a good turnout and I made some good sales there. It was a lovely day, weather-wise, for the first time in a long time. I also saw some Camp Mini Ha Ha friends who I usually only see once a year so it was nice to catch up. 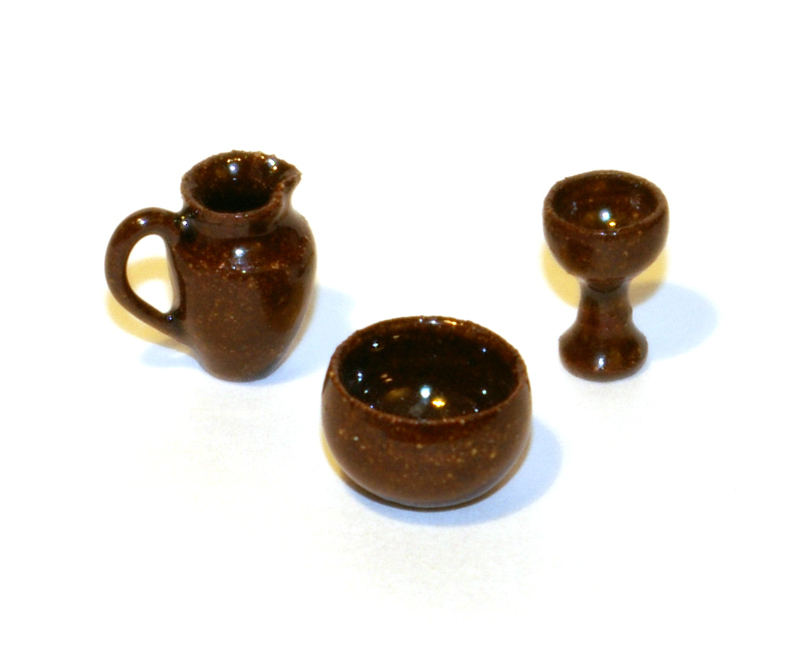 Unfortunately, having forgotten my camera, I don't have any photos to share so I'll put one of my sold items up. 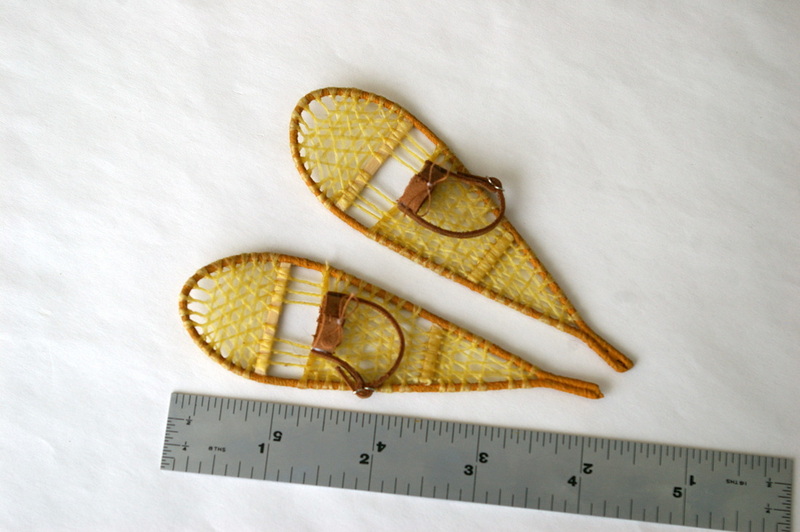 There was much interest in them and I sold two sets of snowshoes so I don't have any more at present. be donated to the museum. This year's theme is Mardi Gras though it is not a requirement. Come to visit and see what we will be making. The Open House is on Saturday and you can also shop from local artisans as well as commercially made miniatures. It's always great fun! 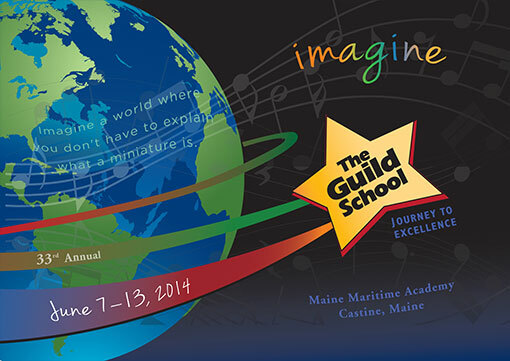 I am very proud to announce that having won a scholarsip to the Guild School, I wil be attending a week long school hosted by the International Guild of Miniature Artisans in Castine, Maine, USA. I am very excited to be part of this amazing event. 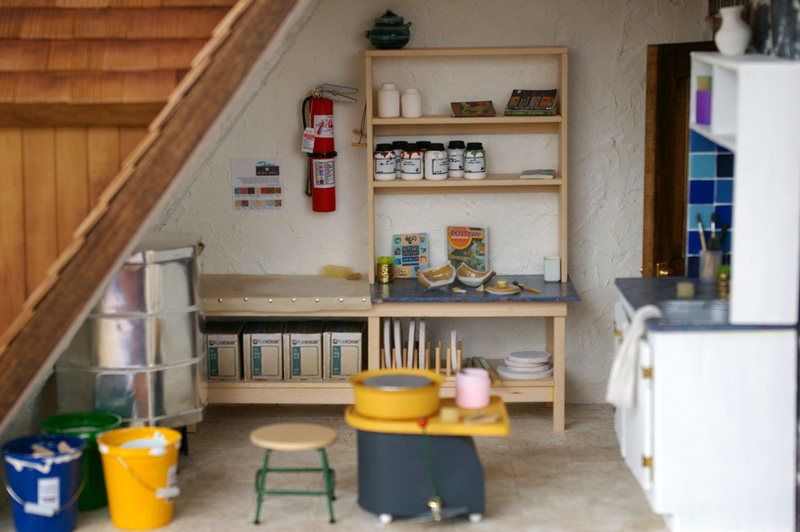 I look forward to learning new skills and meeting miniature artisans from all over the world. One of two sets of snowshoes I sold. 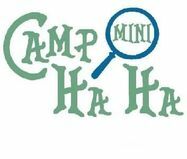 Once again, I will be heading off to Camp Mini Ha Ha for a four day miniaturists' retreat in Cornwallis, Nova Scotia. All are welcome to come and visit at our Open House and Artisan Sale on Saturday, September 28, 2013. You can see our workroom where all the magic happens as well as a display room where previously finished projects can be seen. Bring your friends! By the way, as of September 1, there is still room to register as a camper! 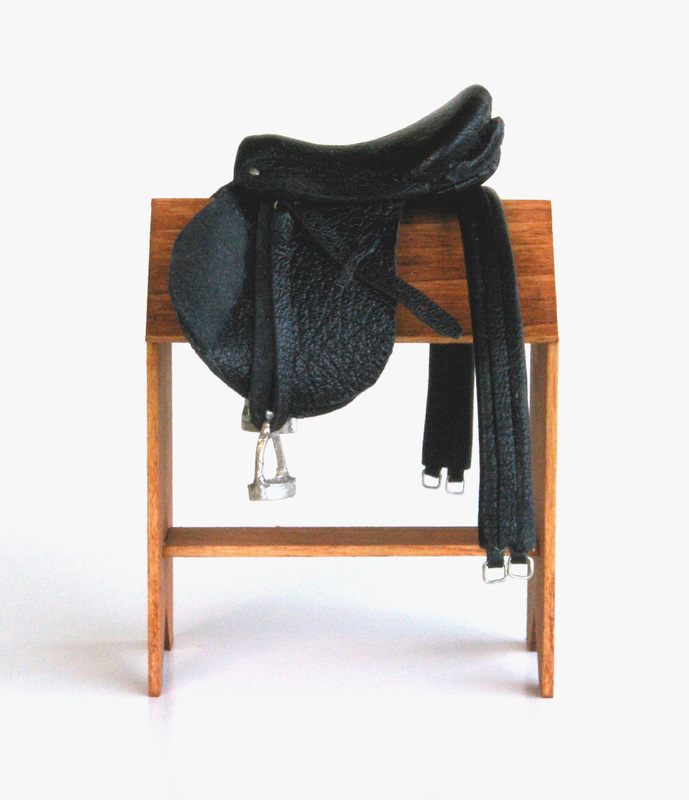 1/12" scale English saddle made from a pattern I developed myself. 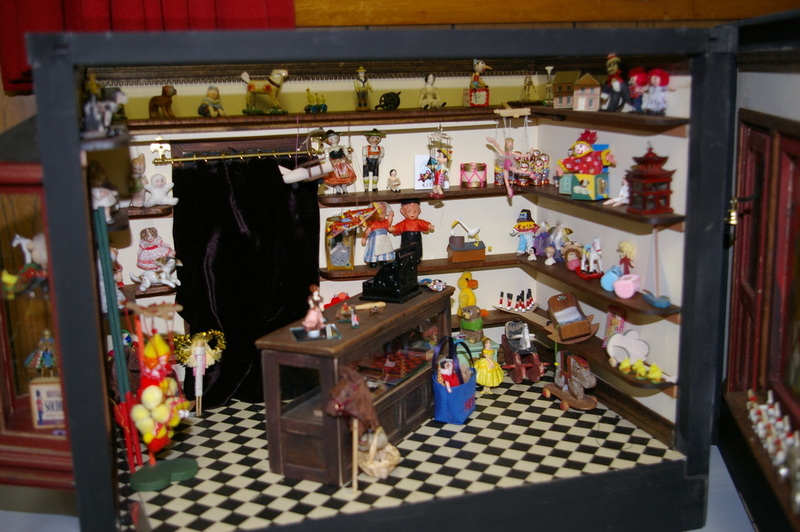 The 32nd Anniversary of the Moncton Doll and Miniature Show and Sale will be held at the Dan Bohan Centre at 5 Fatima Drive, Riverview, New Brunswick. Admission is only $2.00 and door prizes will be held periodically through the day. 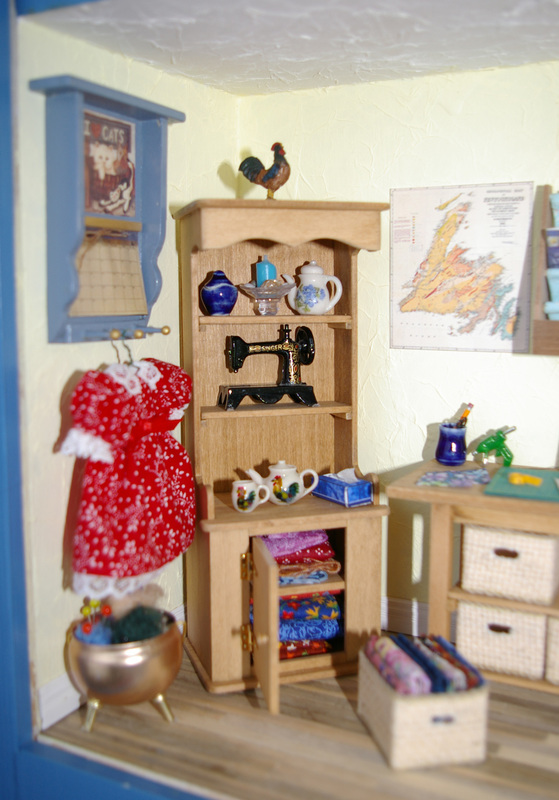 Come and enjoy the exquisite crafsmanship of handmade items as well as admire everything doll and dollhouse related. Doors will open at 10:00 am and close at 4:00 pm. The 15th Annual Shearwater Hobby Show will once again feature the talents of local modelers and miniaturists with displays and sales tables. There is literally something for every kind of collector. When you're not looking at the model/mini displays, you can take in the full size aircraft in the space. The hours of the show are 10:00 am to 4:00 pm both days and there is a model contest on Saturday. The admission is $5.00/person and $12/family. All proceeds will be donated to the museum. 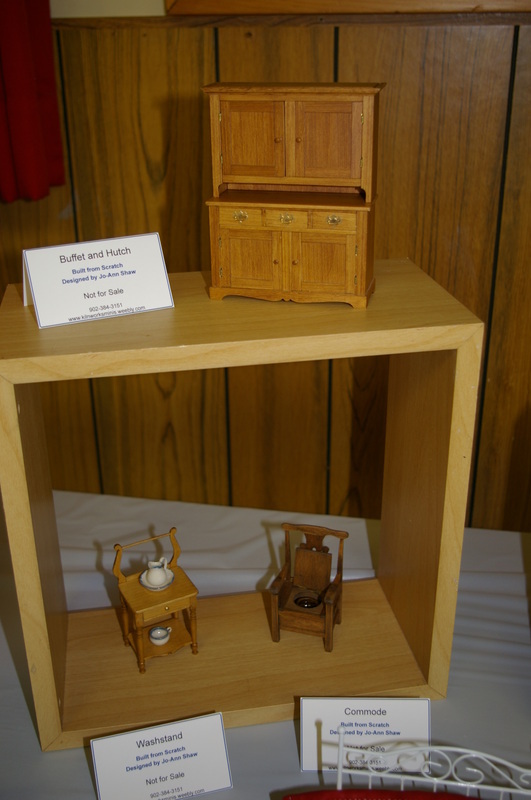 1/12" scale furniture in wood. 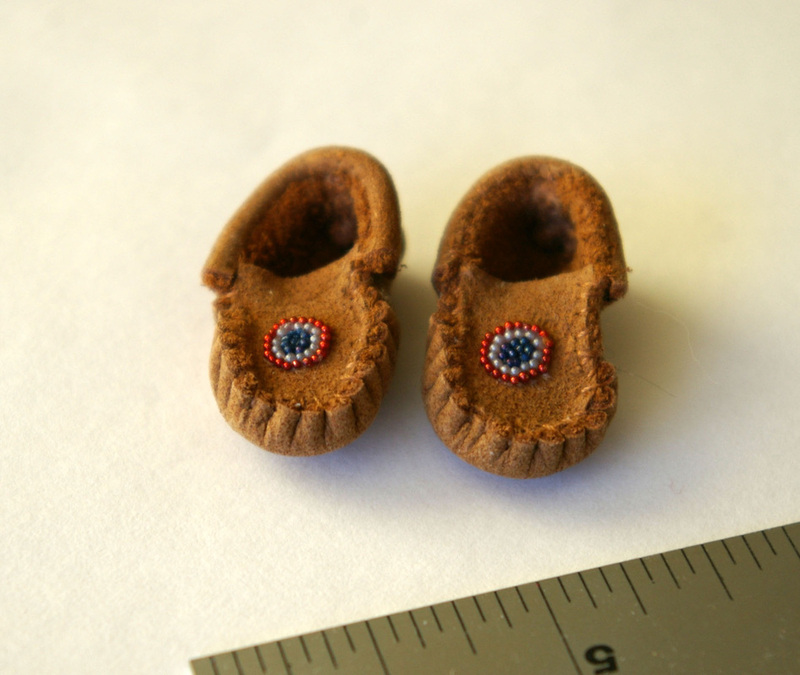 A pair of stitched leather moccasins with beading. My mini store with all the saddles (and most of the other items) being made by me. Items made by my friend, Debbie Parrott in 1/144 scale. 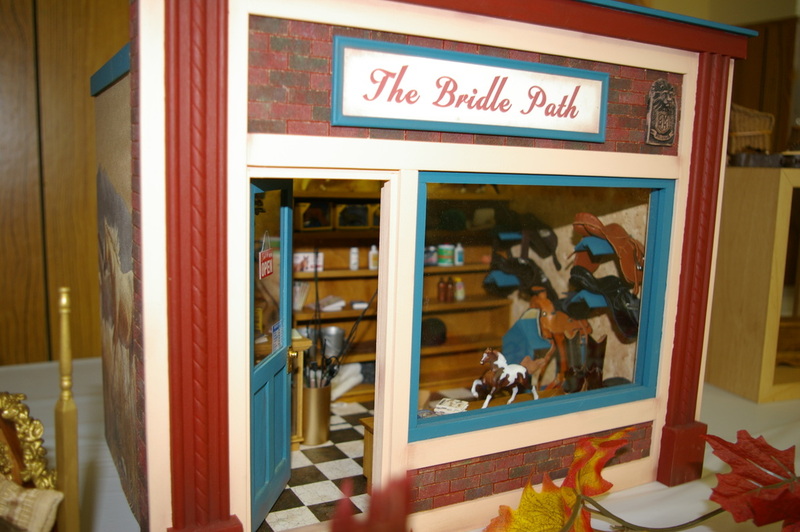 This is the shop mentioned in the article made by my friend, Debbie Parrott in 1/12 scale.